Home Unlabelled Superstition and Popular Devotion: When do expressions of devotion to Ina become superstitious? Superstition and Popular Devotion: When do expressions of devotion to Ina become superstitious? 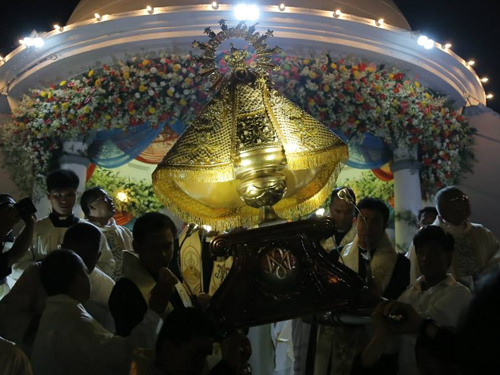 A perfect attendance at the novena in honor of the Divino Rostro or Our Lady of Penafrancia believing that it will absolutely guarantee a certain outcome is a form of superstition. A novena cannot substitute for faithful commitment as well as right decisions and actions. Participation in the novena cannot replace the reception of the Sacrament of Penance and Holy Communion. Material signs like flowers, handkerchiefs or anything touched to the images of Ina or Divino Rostro including the manto of Ina do not have divine powers by themselves. In and by themselves, they do not cure or heal. Only God heals. Only God can cure us. The images of Ina and the Divino Rostro are only channels of God’s graces. How do we know that God really listens to our prayers? God’s first response to our petition is the transformation of the heart. (See CCC, no. 2739) If there is no transformation of the heart, we are not yet praying. When do forms of popular piety become true expressions of faith in God? Viva la Virgen! Viva el Divino Rostro!